MONDAY QUICK HITS: WHO IS BETTER THAN ECU? Tell me one thing. 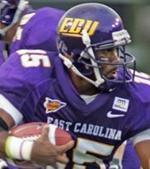 Who is better than East Carolina? You might laugh, but hear me out. If you throw away your pre-determined notions about Conference USA, and if you are able to throw aside your recognition of the preseason rankings, how could you keep them out of the top 10? They have beaten two ranked opponents. They mauled the better team, West Virginia, 24-3. They have a tremendous coach, great athletes, and a consistent quarterback. Patrick Pinkney has completed over 80 percent of his passes so far this season. Running back Jonathan Williams has successfully replaced now-Tennessee Titan Chris Johnson. Williams has scored three rushing touchdowns this year. They run the spread offense better than nearly anyone in college football. ECU is dangerous and deserves a high ranking. If ECU played Ohio State Saturday, they would have won by two scores. If they had played Florida, they probably would have pulled that upset too. If you believe this, then they should be ranked in the top 10. The Pirates are that good. ECU is definitely the story of the year so far. Moving on, the Ohio State vs. Southern California game is now less than a week away. The Buckeyes looked pathetic against Ohio. They were down 7-6 at halftime. The won 26-14, which makes many OSU fans nervous. Ohio State is not a top five team without running back Beanie Wells. Luckily, Wells will be back for the USC game on September 13th. The offense looked vanilla and lethargic. As Buckeye fans say, they played it close to the �vest.� While other teams run trick plays to beat FCS schools, Ohio State hides their playbook so USC, who was on bye, has very little film to break down. Terrelle Pryor rarely saw the field against Ohio. If you ask me, they were hiding him so they can unleash him against the Trojans. The ACC and Big East looked weak, yet again. Wake Forest seems to be the only team in the ACC worthy of a top 25 ranking (lets wait to see Florida State against a FBS team). Georgia Tech got a big win against Boston College. Paul Johnson, Tech�s head coach, is doing a great job so far. On the other hand, Boston College looks lost without Matt Ryan. Maryland and NC State will struggle this season. Those teams are a shell of their former selves. The Big East also struggled. West Virginia�s offense was shutdown for the first time in years. When West Virginia�s offense fails to put up twenty points, something just feels wrong. Syracuse gave up 42 points to Akron in a 42-28 loss. Pittsburgh snuck by Buffalo, just like USF barely managed a win over UCF. Even Connecticut, who I have high hopes for, had to go into overtime to beat Temple. Is anyone else drooling over the thought of next week? After a sub par week two, college football fans deserve a week like the one on the horizon. The week is kicked off with some good Thursday/Friday games, the latter being Kansas at South Florida. Which small mobile quarterback (Matt Grothe and Todd Reesing) will be able to will his team to victory? Georgia faces off with South Carolina, who will look to shake off a devastating loss to Vanderbilt. UCLA will attempt to continue their winning ways against BYU. If BYU can get through this game, only Utah and TCU can stop them from going 12-0. Rivals Michigan and Notre Dame will battle for national respect. From what I saw Saturday, Notre Dame does not look any better than they were in 2007. Is Weis really the man for this job? Oregon visits Purdue in an interesting match up of big time offenses. Auburn will begin conference play with Mississippi State, who is stewing after a loss to Louisiana Tech in week one. Washington will try to avoid starting 0-3 when they host Oklahoma. UW�s schedule is just unfairly tough. Wisconsin will venture to the west coast to play WAC favorite Fresno State. Fresno State, who has BCS aspirations, must win this game if they want to keep those dreams alive. A Wisconsin victory would help the Big Ten from a national respect standpoint. Ohio State and Southern California cap off the night with one of the biggest games of the season. Southern California looked scary good against a lowly Virginia team in week one. How will the week off affect the Trojans? Since week two lacked big games, it was a good week to pay attention to the little guys. Here are a few things I noticed. Bowling Green, fresh off of their upset of Pittsburgh, got rolled by Minnesota 42-17. BYU did not deserve to beat Washington in regulation. That game should have gone into overtime. There was no reason for the refs to flag Jake Locker for excessive celebration. He scored on the (likely) last play of regulation. He was excited, just like the fans and his teammates. He did not taunt or insult. The refs made a huge mistake. The Rice-Memphis game was the game of the day. Rice was down 35-20 in the fourth quarter. They managed to tie the game late after quarterback Chase Clement ran for a nine-yard touchdown (and then converted a two-point conversion). Memphis was driving into Rice territory when Chris Jammer intercepted Memphis quarterback Arkelon Hall and returned it 66-yards for a score. Memphis was left with under :20 seconds on the clock and could not answer back. A budding rivalry is USF/UCF. USF, a Big East favorite, beat UCF in overtime after blowing a late lead. The game was fun to watch and very intense. Imagine if West Virginia and South Florida lost to Conference USA teams on the same day! Middle Tennessee State upset Maryland (which I predicted before the season started). However, Maryland struggled to beat Delaware last week. This was a great win for MTSU, but it is more about how far Maryland has fallen than anything else. Louisiana Tech, fresh off of an upset of Mississippi State, got shutout bye Kansas 29-0. This is not a disappointment at all. Louisiana Tech wanted to win one of these early season games, and they did. It will be interesting to see if they can compete in the WAC with Fresno State, Nevada, and Boise State.